Do you live an active, busy life? With two Alaskan malamutes, we are constantly on the go. While it may not be as much in nature as I would like, that doesn’t mean we aren’t traveling, visiting friends and family, and sometimes going on big adventures that leave our phones at risk. For example, my poor phone recently ended up soaked in water for under a minute ,which totally fried my poor phone. After such an expensive replacement, I decided that when it was time to replace my mother’s outdated phone, I wanted to get her something rugged, easy to use, and powerful enough that she could use it during her own travels, especially since she travels quite a bit with my aunt. Since is also on a budget, many of our options were limited, at least until we heard of the brand new Kyocera Hydro SHORE Smartphone. When I heard we could review a complimentary phone, I couldn’t wait for our Kyocera Hydro SHORE Smartphone to arrive! Looking for an inexpensive phone that is not only waterproof but durable? If so, we think you will love the Kyocera Hydro SHORE Smartphone. This smartphone is designed to fit in just about any budget while taking one of the biggest smartphone killers – water. As a matter of fact, it can swim in up to 3 feet of water for approximately 30 minutes, making it a great starter phone for kids or a phone for those who are a bit more accident prone. As well as having a 5 inch display, the Hydro Shore also has Wet Touchscreen Operation, which allows the phone touch screen display to remain functions when wet, making that you can still answer an email, make a call, or even take a picture in the rain. To learn more about the latest Kyocera phone, make sure to watch the video below! To properly test the Kyocera Hydro SHORE Smartphone, we decided to go out to one of our local state parks and go hiking with the girls. 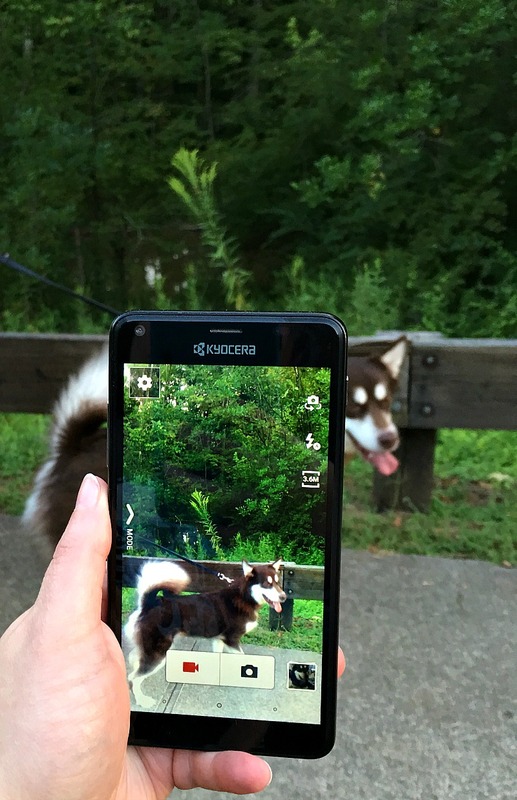 With concrete trails, brush, steams, and wooded trails, it isn’t too shocking that this environment can be quite hard on phones, especially when you are trying to guide two very excited malamutes. One of the things I really liked about the phone was its size. I will be honest, I fought for quite some time moving up to a larger phone but with how much time I spend doing work on my phone, I couldn’t imagine going back to a smaller display. With the larger display, it is easier to take pictures, edit them, and even browse the web with ease. As well, the picture quality was quite impressive, especially for a phone in this price range. Honestly, we were also quite impressed with the power in this phone, something I didn’t consider possible for a phone that is under $80. 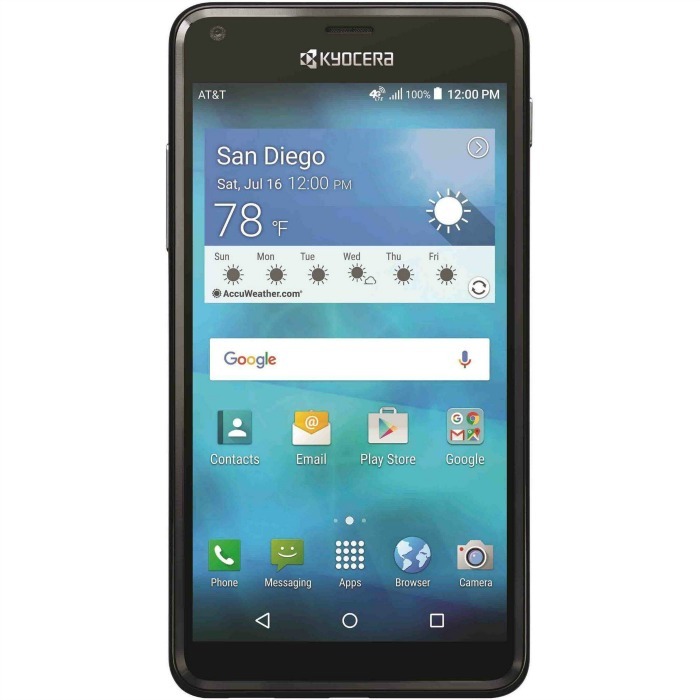 If you are looking for an inexpensive phone to fit in a tight budget or just a great starter phone for someone in your life, we highly recommend the Kyocera Hydro SHORE Smartphone. Would you like to purchase this awesome phone for yourself or someone in your family? You can find the Kyocera Hydro SHORE Smartphone exclusively at WalMart for only $79.99 on the AT&T GoPhone service (sold separately). To see if this phone is sold near you, make sure to check out the WalMart store locator. Want to learn more about Kyocera? Make sure to follow them on social media! Wow that is a nice phone and not very expensive. I’m thinking of my nephew with his kayaking and fishing has lost a couple of phone from water. I want to tell him about it! That does look like a great phone. I just got my first smartphone last month so I’m not in the market for a new one. I love the way this phone works and what you can do with this, I bet my older grandboys would enjoy using this type of phone. I like the waterproof fact!! The fact that it comes from Walmart and is $80 is nice! I use Straight Talk fro Walmart and this would be great! I really could use a phone like this inexpensive and easy to use,my phone is free from Medicaid and useless. My current phone has been okay, but I like that this phone isn’t super expensive. I will keep it in mind when I go to replace my phone. I have never heard of this brand of smartphone before. It is certainly cheaper than an iphone! Seems like a great phone. I am dying to buy me some type of smartphone since I have never owned one. I’ve never heard of this phone. Thanks for the post. I’m glad they’re making phones waterproof now. I killed my first cell phone by dropping it in the toilet. I have never heard of this phone. I really need a more inexpensive but durable phone for a teen. Maybe we should look at this one. It has nice features. I would like this smart phone, and the app. This would make life a lot easier indeed. I am not real big on tech but I think it seems like a nice phone. Sounds like something this mama needs!! Mine is always getting wet on our adventures! !